Are you looking for a step by step guide to change the IMEI number of your iPhone then you are at the right place? 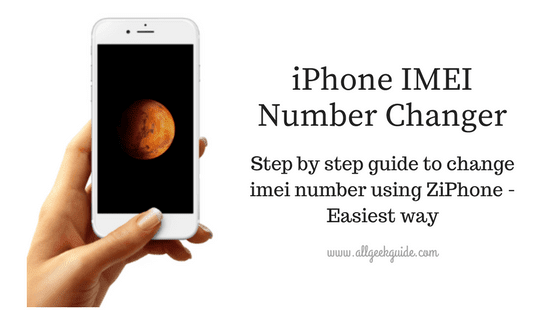 Here I will show a simple tutorial to change IMEI number of your iPhone using ZiPhone. IMEI or International Mobile Equipment Identity number contains 15-17 digits code which is used to identify a phone over a cellular network. Sometimes, it becomes very helpful for CBI or police to track the location of terrorist and criminals. Changing the IMEI number is a very easy task if you follow all the steps carefully which has given below. But, before going to the guide, I will warn you to not to use below tutorial for any illegal activity. This guide is only for educational purpose. You will be responsible, if you do any illegal activity..
1. iPhone must be unlocked because this tutorial only works for 4.6 BL (112 and 113 ootb). 2. You need to jailbreak your iPhone. 3. Download and install ZiPhone on your computer. Note:- dial *#06# to get your IMEI number and note down it to a paper. If you want to restore your IMEI then it will help you. How to Change IMEI number of iPhone using ZiPhone 2017? 1. First, of you need to download and install ZiPhone on your computyer. I assume that you already did it. 2. Now press Windows+R simultaneously to launch the command prompt. 3. Now start the phone in recovery mode. You can do it by pressing Sleep/Wake and Power button and hold it until the apple logo appears.Then release the Sleep/Wake button and the iTunes logo with a cable will appear on the screen. 4. Now, connect your phone to the PC. 5. Now in the command prompt, type the full address of the folder location on ZiPhone.cd Desktop/ZiPhone. 6. Now, all the options related to the uses of the ZiPhone will be displayed on the screen. Note: Instead of 123456789012345, you need to type your required IMEI number. 8. Now, ZiPhone software will start to change the IMEI number of your iPhone. Just wait until the process gets finished. Now, when the process gets completed successfully then you device automatically gets rebooted. That's it. Thanks for reading the tutorial. I hope the above step by step guide helped you to get a new IMEI no. for your device.